DuPont Pioneer started from an indirect angle in the patent battle field at the time when the media were focusing on the interference between Uni California and the Broad Institute: DuPont Pioneer negotiated in June 2015 an exclusive license for commercial use in agriculture with Vilnius University, which was silently but surely holding another of the early CRISPR patent assets. Fours months later, in October 2015, DuPont Pioneer brought this exclusive license in addition to their own patent assets in a cross-licensing negotiation with Caribou BioSciences, which is the exclusive licensee of the Uni California (Doudna lab) pioneering CRISPR-Cas9 IP due to agreements back in 2011, pre-dating the invention of CRISPR-Cas9. In June 2017, DuPont secured another exclusive license for all agricultural uses and applications in plants with ERS Genomics, which is the exclusive licensee of the Emmanuelle Charpentier pioneering CRISPR-Cas9 IP. And last but not least, in October 2017 DuPont entered into a joint non-exclusive licensing agreement with the Broad Institute for use in commercial agricultural research and product development (except gene drive and tobacco for human use) on the CRISPR-Cas9 IP held by the Broad Institute and its collaborators (incl, New York Genome Center, New York University, the Rockefeller University and University of Iowa). By jointly analyzing the licensing and the patenting data, the strategy of DuPont Pioneer to secure a lead position appears quite clear and well-prepared. DuPont was very early exposed to CRISPR as they acquired Danisco in 2011. Indeed, Danisco was one of the earliest CRISPR patent holders in the early CRISPR research history (yet for yogurts culture, rather than genome editing). DuPont has been regularly spotted in the IPStudies data as the top 1 industrial CRISPR patent holder – as early as in 2014-2015. 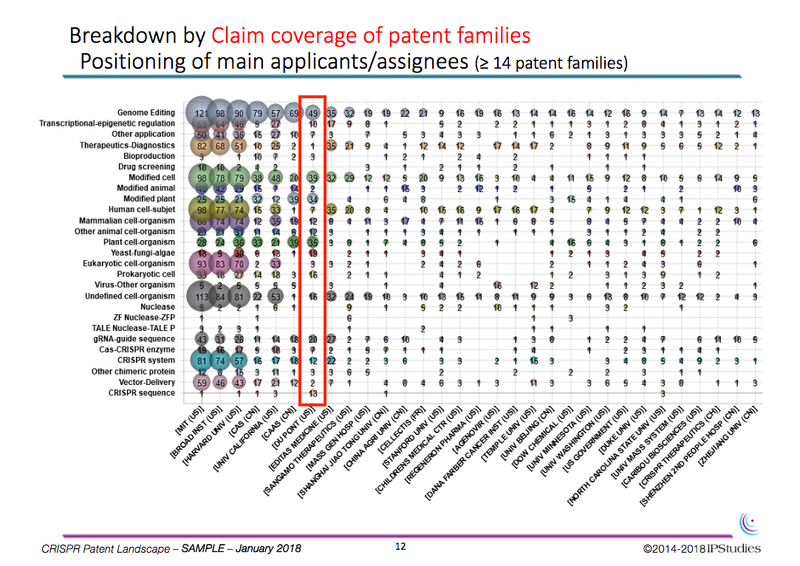 Even if they do not lead the number of inventions compared to the Broad and Uni California researchers (2230 CRISPR inventions in the 2018 IPStudies CRISPR landscape, approximated by patent families in our qualitative patent analytic metrics). Moreover, we observed that DuPont files more international extensions at the PCT national phase entry than the academic players – they obviously have more budget than academics, both for licensing-in and patenting. This biases their ranking position in the total number of more than 6000 patent assets (pending and granted patent applications) in our 2018 landscape. Last but not least, as the merger of Dupont with Dow Agrosciences passed regulatory green light end 2017, the new DowDuPont conglomerate will add the Dow assets to their CRISPR portfolio. Interestingly, Dow has also been spotted as one of the key industrial patent holders throughout all our CRISPR patent landscapes since 2014. This merger thus further strengthen the leadership of DowDuPont in certain agricultural application technologies and markets. We note that this clearly supports their corporate strategy in particular in European markets, with CRISPR as a key technology to master in the NBT (New Breeding Techniques) agricultural markets possibly out of the EU GMO regulatory restrictions (Feb 2018 DowDuPont EMEA interview). In the US, DuPont announced back in April 2016 their intention to develop elite waxy corn hybrids as their first CRISPR-Cas product. Of course, it is no surprise that direct DowDuPont competitors including Monsanto and Bayer (also pending merger) as well as Syngenta have also all taken certain positions into both the licensing landscape and the patent landscape. All this information is available in our 2018 release of the IPStudies CRISPR patent landscape. The IPStudies CRISPR analyses are independent, neutral and solely funded by our data subscribers. All our qualitative patent analytics are conducted by a PhD technologist with research experience in the field of analysis, and we comply with the highest Swiss quality standards in information analytics for R&D technologist and investors. Beyond our patent landscape and monitoring services, in 2018, we are also developing a new offering to facilitate access to our data and/or expertise in a specific subset of your choice (applications, components, or chimeric proteins). We also now offer our compilation of licensing information separate from the patent data. Interested? Please contact us for a quote! February 16, 2018 February 16, 2018 Corinne LE BUHANComments are off for this post.